Runs To Get Waisted: Countdown to Thanksgiving! Today was so much better from an eating and activity standpoint. I don't know why, but I've been in a super great mood today. Maybe it's because I'm excited that Thanksgiving is near or maybe because I got 8 hours of sleep. Regardless, I'll take it. I started out the day with a 2 mile walk with Molly, which was very nice. It was in the 50's here so all I needed were my compression capris and a t-shirt. It was nice not having to bundle myself and the dog up like Kenny from Southpark! 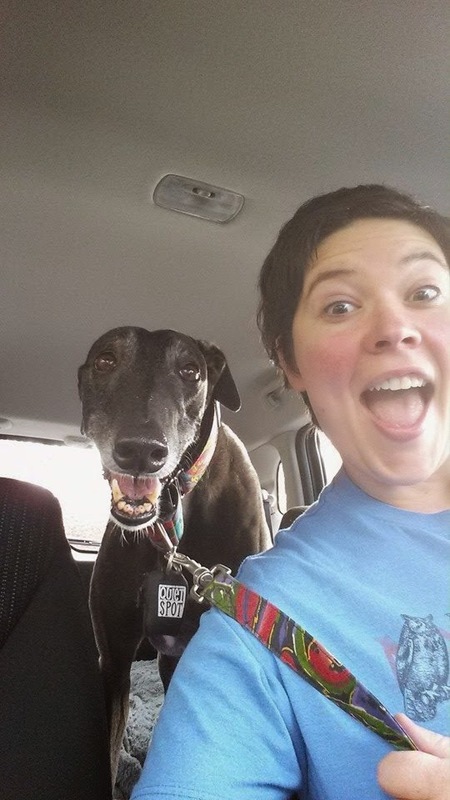 After we were done, Molly and I had some selfie fun in the car. The most remarkable thing is how happy she looks in the picture, she HATES having her picture taken so she usually looks like a depressed praying mantis when I try to do selfies with her. After we finished up, I popped over to New Seasons to pick up our turkey! Since it will be just me and Eric (plus I'm sure Molly will finagle a slice), I just got a little 11 pounder. I did some last minute shopping for things I need for Thursday, but other than that, I'm ready for Turkey Day! I have even been working on a playlist of music to put on while we're just cooking and having fun. Once I got home I did my Richard DVD and settled in for the rest of the day. I still have to do my Stomach Formula Day 27, but that will only take 7 minutes. I'll go do it right after I publish this blog. I love me a low key turkey day! Good luck with your cooking!